Writing a book is not a solitary venture. In order to produce an edited and polished book, the talents of others are necessary. The following people made the process easier, and have my heartfelt thanks for their time and talent. My sister, Kathryn Burke, for reading raw chapters, giving honest answers and in general being my muse. Brenda Reddick and Lottie O’Malley, for agreeing to beta read and their wonderful feedback. Thanks to Jefferson Hansen, JPHansen Editing, not only for his editing expertise, but for such a positive experience. Retired West Yorkshire Police Inspector, Kevin Robinson, U.K. for sharing his knowledge of the Metropolitan Police and their procedures. Any errors in procedure are my misinterpretation of his sound advice. 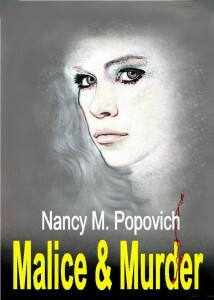 Malice & Murder is a tale of friendship, loyalty and a determined quest for a murderer. In the act of saving the life of his friend and fellow agent during an intelligence mission, Steven Hunter is badly injured by a bullet. When he surfaces, it is in a familiar childhood place where he sees his lifelong friend, Charlotte. There is however, a small wrinkle. Not only did their torrid affair end badly, she’s been dead for five years. Charlotte’s ghost asks for his help to track down her murderer. Still stinging from the end of their affair and what he considered her betrayal, Steven wrestles with his conscience about helping her, especially when Charlotte reveals a hidden side of her life, which jolts his rigid code of honor. The search for her murderer takes Charlotte on a revealing journey back to her former life, her childhood home and the place where she was murdered. Along the way, she encounters a new associate, who joins her on the voyage to find the truth. When the truth is revealed, they witness an unimaginable and hitherto unknown form of justice claim the murderer. By Susanne Lakin – Nancy Popovich starts off this fantastical adventure with a man named Steven becoming aware that he’s in a hospital being rushed down a corridor on a gurney, realizing he’s been shot and wondering if his wife has been as well. When he slips into unconsciousness, his best childhood friend, Charlotte, who has been dead some years, appears to him, pleading for his help to solve her own murder–but he only has five hours in which to do it. Thus begins a wonderful story with imaginative twists and engaging writing. This book will take you on a wild ride with a rich plot and intriguing premise. Don’t miss it! By Linda Cheek – Murder, intrigue, love. This story has got it all. The unknown of what happens to us in the spirit world. We’ve heard of people hanging around after death to get some resolution. The TV drama The Ghost Whisperer demonstrates that. The spirit world is so far away from us, or is it? Malice and murder weaves a murder mystery, past and present together in such a way that it keeps you on the edge of your seat. Who’s the bad guy? You’ll never know until the end, and I’m not going to tell you. I’m just going to tell you that you need to find out for yourself. This is a real thriller that you can’t put down. By Lakefront Muse – When I first started reading Murder and Malice, I thought ‘hmm… there’s no formula of drama and excitement’. Then I thought, ‘there’s the odd typo or spelling mistake’. Then my heart and mind took over. Damn, this is a Good Story! And that was it. I was carried away into Charlotte’s world: her murder, her need to get her near-dying ex-boyfriend cop to help solve it; his buddy being killed trying to solve her murder. The suspense wouldn’t stop. I became hooked. Set in England, I became enchanted with the Old World dialogue of “shall” and “upon”… another shift but a very welcome one. This is a finely crafted story in the spirit (sorry about the pun) of “Ghost”, that catapulted Patrick Swayze’s career to new heights and took Whoopi Goldberg along for the scene-stealing ride. I see movie rights… seriously!